Our aim in MKC is to teach kids about who God is, because the world will do its best to teach them who He is not. We serve, teach, empower and we minister. We are passionate about sharing God’s love and everything that we do is purposeful. 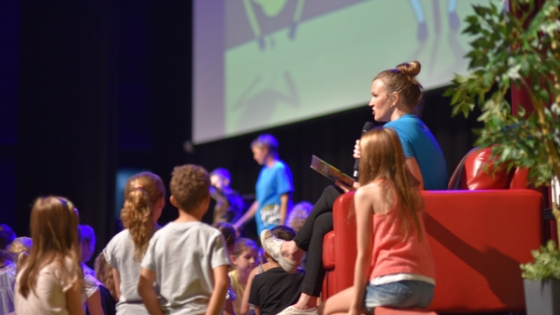 Every Sunday morning, we have an amazing time creating an environment where children can experience God in a relevant and exciting way, where they can grow in their faith and knowledge of God and connect with others. Check in opens 10 minutes before each service at the level 3 foyer. Our fantastic MKC volunteers (the ones in the blue t-shirts) will welcome you and help your family register. Make sure your child puts on their name tag and you keep the parent pick up tag. One of our volunteers will show you to your child’s room and introduce them to some new friends. Please let us know if your child has any allergies or additional needs during check in. If you would like to fill out a registration form, we can ensure that your family details are entered into our electronic system. The next time you attend a service, you can simply enter your family name, click check in, finish and print. This will check them in. Make sure your child puts on their name tag and you keep the parent tag for pick up. Please make your way to your child’s age specific room, and present your parent tag/sticker to pick up your child. Volunteers and security dads will be on hand to assist you in any way, and to ensure that each child is leaving with their appropriate adult. Playtime is a wonderful opportunity for both parents and children to connect and be a part of a supportive community. It is held every Thursday between 9am-11am during term time, and is a gold coin donation. Designed for aged 0 – 5 year olds, Playtime has a great balance of directed free-play through a variety of toys, role play, sensory play and other age appropriate activities. We include a healthy morning tea at approximately 9:45am, which is followed by a fun, creative component found in a group craft time. This is followed by more free-play, before we conclude the session with a group mat time that usually involves a story, song and parachute play. We also provide a delicious morning tea for the adults. You are more than welcome to come along and join the fun! Mainly Music sessions are held every Wednesday and Friday from 9am – 10:30am during the school term. Created specifically for aged 0 – 5 year olds, Mainly Music is a fun, interactive music session where a child and their parent or caregiver can enjoy music, movement, interaction, rhymes, puppets and more. Mainly Music is a structured session but the focus is on the interaction between ‘big person’ and child. The amazing outcome is learning and development – numbers, alphabet, colours, direction, using fine motor skills, practicing jumping and skipping and hopping and more! The cost is $3 per family, which can be paid weekly or for a whole term, whatever is easier. We also provide a morning tea for both children and adults. Please come along and experience the fun!